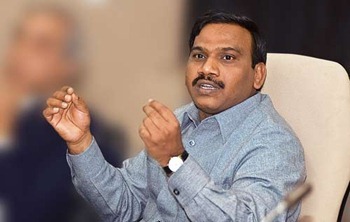 A Raja, former telecom minister has been on extended custody for four days by CBI has ended today. CBI has asked for the extension of Raja’s custody because he was not co-operating with them. Along with Raja, Shahid Balwa, Managing Director of DB Realty and promoter of Swan Telecom Ltd custody’s also come to an end. Raja has been arrested by CBI on selling spectrum at cheap prices to various companies in 2008 when they applied for mobile network licenses. This is the first time after his arrest when he was produced before the court in Mumbai on Tuesday. Both Shahid as well as Raja have been confronted by CBI for 2G spectrum scam. CBI has made both of them answer questions relating to license and undue favors extended to the companies during 2008. CBI is also investigating various documents and transfers of money from Sawan Telecom to his close relatives and acquaintances of Raja. When A Raja was the telecom minister, Sawan telecom was supposedly one of the two beneficiaries of his spectrum generosity. Agency discovered that Sawan Telecom was granted license for Rs 15,00 crore who has further sold its bet to Etisalat, a Dubai-based firm for nearly Rs. 4,200 crore.